The Emperor Meiji - in appreciation of David JACKSON's work - presented him with The Silver Bowl which was the start of my interest in this and other stories. The Bowl was a "presentation bowl" cast with the Chrysanthemum Design of the late 19th early 20th Century. Only the Emperor could use this particular pattern, which was meant to signify long life (ironically, not to be for David JACKSON). It was likely presented at the same time as JACKSON was also recognized by the Emperor with "The Order of the Rising Sun". Apparently at the same time of the presentation of the Bowl, a candelabra was also given to David JACKSON, but we do not know the whereabouts of that. The medal is in the collection of Christine Wright of Gilford Castle and the photograph beneath is from my 2003 trip. The medal measures 6" X 2.5"
… the reason for the gift may be assumed from the fact that it was during David's tenure as Manager, Yokohama (which meant, in practice, Manager for the Japan operations of the Bank) that the Japanese reentered the foreign loan market. The Hongkong Bank was a member of and chief negotiator for the key consortium handling the loans through London. Thus David played a key role in this matter of vital economic importance to Japan. The award by the Emperor was made on the advice of his government. There would be every reason to single out David Jackson. You will undoubtedly find studies dealing with the Japanese loans. It is just possible that one such study might mention the gift, if only in a footnote. Worth a try! Or you might look at the Addis papers in SOAS Library archives, a collection which is indexed (and a copy of which would be at the HSBC archives, I would expect). At this stage, we know little of the life of David JACKSON and his wife, Margaret WRIGHT. He apparently attended the Annaneese School (Presbyterian). It was a small school, 26' by 15' by 8' and was built of stone and lime construction with a slated roof. It was built "near McCooey's cross" and had been in existence from 1860. It probably closed down in 1879 when David Ranson became principal of Church Street School. SOURCE: At the Ford of the Birches, p. 209. Presumably, he lived nearby at Urker. His wife, Margaret Louisa WRIGHT, was a daughter of Robert WRIGHT, a mill owner in Ballinode, Co. Monaghan. Her brother, Robert T. WRIGHT, was manager at the HSBC Branch at Yokohama in 1886 and her mother's family was intermarried with the JACKSONs as well. There are several WRIGHT family connections in Singapore, Yokohama and Hong Kong. As well, it is the WRIGHT family of Gilford Castle, County Down who have been the source of many of the photos and documents which underpin this extended family history. Their marriage is mentioned in the letters of his mother at the time. 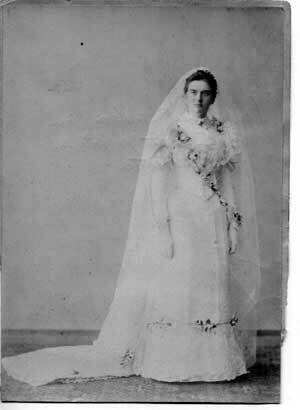 It seems that she was in Monaghan during the courtship and went to Japan for the marriage. Your brother [David Jackson] and [G.H.] Townsend go out by this mail, and I told them both to try and save money at once. I also told your Brother to tell you to do the same. I hear you have been entertaining all Hongkong with dancing parties almost weekly. Save your coin is my advice. You will find the dollars useful when you come Home . From the date of this letter, we know that David JACKSON went to Hong Kong on March 8, 1878 . On the face of it, David JACKSON did not have an exceptional record, which makes the attentions of the Emperor even more puzzling. As King points out (Ibid vol. 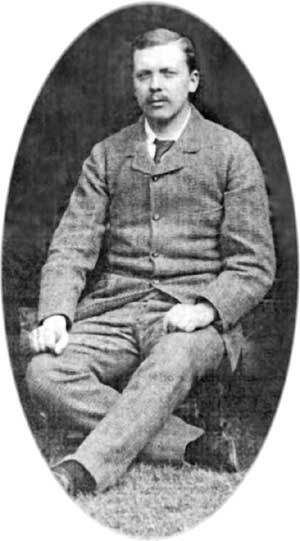 II, p.13) “David JACKSON (East in 1878), TJ’s younger brother, however successful in Yokohama, did not have a uniformly brilliant record.” (In order to be considered for the Chief Manager’s position.). Not exactly a commendation.He died of an aneurysm of the heart in 1903 and was remembered by Addis, ‘He was an able chap and very kind hearted.’ (King, Ibid. Vol.II p. 16). Surely this is lukewarm praise if ever it was heard. On the other hand, family elders remember it being said, "David Jackson drunk was a better banker than Thomas Jackson sober". Certainly, it cannot have been easy being under the shadow of his older brother - the one who was his mother's obvious favourite. Then there is a further mystery. Beneath is a photo of a group of people on the steps of a bank. There are few people in this photo who are known to me. Daniel Gunn Browne is wearing a top hat and is top corner right; David Jackson is in the middle facing right and wearing a boutonniere; his older sister Margaret is seated in front of him, also facing left. Regrettably, I didn't scan the back of this photo but my notes say that the photographer was from the Isle of Man. Going by what can be read in the two windows above this portrait, it was my initial guess that it was taken at the Port Erin Branch of the Isle of Man bank (which opened in 1894). I had to give this notion up when I realized that one of the people in the photo - Daniel Gunn BROWNE - had already died in 1892. Also, just because the photographer was from the Isle of Man does not mean that is also the location of the photograph. Dundalk, Newry and various other places are possibilities - although I haven't been able to narrow it down more than that. I did walk around Dundalk and no contemporary banks have this appearance (for what that's worth). Given that the Isle of Man Bank opened branches in 1865, it is still not impossible that this is a photo of one of the other early branches. Then again, it could have been another Bank altogether. Dating the photo still eludes me. Although it is possible that David JACKSON's earliest banking experiences could still have taken place on the Isle of Man (since he didn't join the HSBC until 1877 at age 22), still he looks too old in this photo for that to be true. 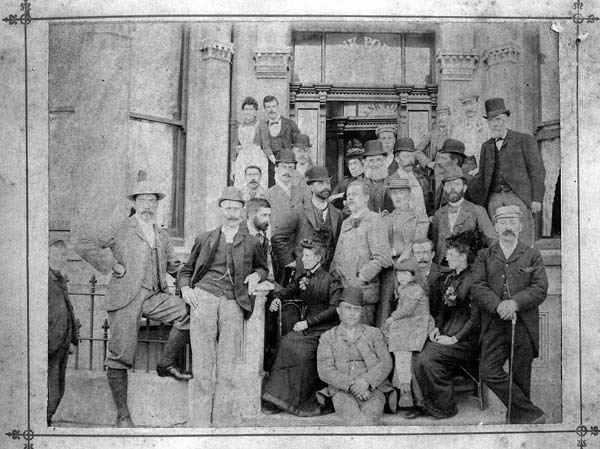 He looks to be more as he appeared at the time of his wedding in 1893 - in his late 30's..
Of the people known to me so far in this photo, David Jackson is in the centre of the photo with his left hand in his pocket; his sister Margaret (two years older) is seated just in front of him and facing left; the man to David Jackson's right is probably his brother James (five years older and married to Elizabeth BROWNE, daughter of Daniel Gunn Browne); Daniel Gunn BROWNE (an uncle of David JACKSON through marriage) is standing in the upper right and wearing a top hat. Other faces look familiar, but I have yet to place them. The gentleman standing to the extreme left has been seen in photos from Hong Kong. It is also possible that the white bearded man standing behind David JACKSON is his father, David JACKSON Sr.
David Jackson died in Hong Kong of an "aneurism of the heart". MR. DAVID JACKSON, whose death at Yokohama on July 27 last is announced in the Japanese newspapers which have recently reached England, was one of the most popular and best known members of the British community in the chief port of Japan, where he had been for many years manager of the local branch of the Hong-kong and Shanghai Bank. He was a younger brother of Sir Thomas Jackson, who, as general manager at Hong-kong, raised the Hong-kong and Shanghai Bank to its present position as the leading British financial institution in the Far East. "Death of Mr. David Jackson"
A telegram was received to-day by the Head Office of the Hongkong and Shanghai Bank announcing the death from aneurism of Mr David Jackson, manager at Yokohama. The late Mr. Jackson arrived in the East in April, 1878, and was mainly in Shanghai down to 1884. He was agent at Hankow up to 1886, and sub-manager at Shanghai in 1887, leaving in 1888 for Bombay, where he was agent until 1892. He was appointed as manager in Yokohama in 1893. Of a genial, hospitable, and open-hearted nature, Mr. Jackson was one of the most popular men in Yokohama, and was highly respected by the Japanese, only recently receiving a decoration from the Emperor for his services in connection with the last loan. He was a brother of Sir Thomas Jackson, the late Chief Manager, and leaves a widow, the sister of Mr. R.T Wright. His sudden death comes as a blow to his colleagues in the Bank and his wide circle of friends and acquaintances here. Mr. Jackson was a young man, being only about 49 years of age. 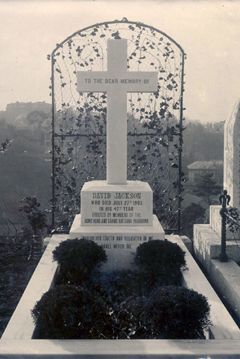 The above inscription reads: To the dear memory of David JACKSON who died July 27th 1903 in his 47th year. Erected by a member of the Hong Kong and Shang Hai Bank Yokohama. "Whosoever believeth in me shall never die." The obituary to the right was brought to my attention by historian Eileen Scully of Bennington College. Thanks!